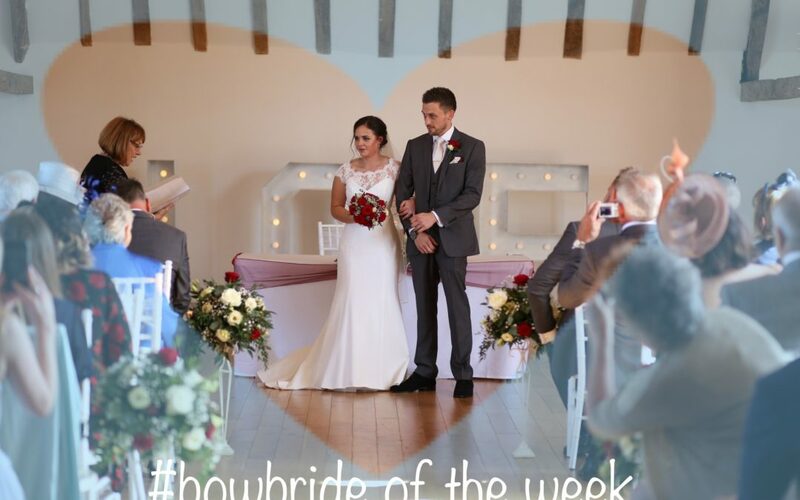 This week we are featuring our beautiful bride Beth who wore Mayfair by Suzanne Neville with the Hepburn Jacket. Beth’s gorgeous photographs are by Gez Harris Photography. After trying on a fair few dresses as soon as I put on the ‘one’ I knew. The dress I choose was Suzanne Neville’s Mayfair and I paired it with a beautiful lace bolero. Once I’d had all my fittings it fitted like a glove. I absolutely loved the button detail running all the way down the back. 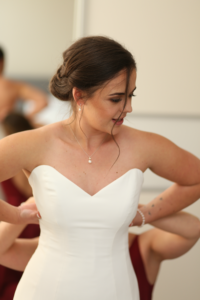 It was just the most beautiful dress, I felt amazing in it and it was so comfortable on the day. We looked around and researched lots of venues for the wedding. 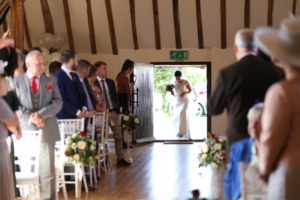 I’ve always loved the idea of getting married in a beautifully decorated barn but the other factor was that I wanted the ceremony and reception to be in venues close to one another so people didn’t have to travel too far in between. 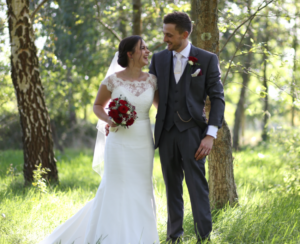 We had our wedding at Skylark Golf and Country Club in Whiteley. It has a beautiful barn where we had the ceremony and then the reception was in the Golf and Country Club. The room we had the wedding breakfast in had the most amazing views overlooking the golf course and grounds. 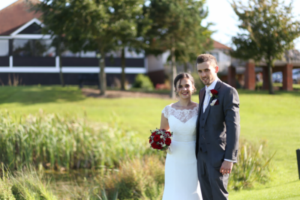 We went off and had our couple photos around the golf course and it was just stunning. It was the perfect location. I researched lots of photographers and struggled to find one that offered a package that I wanted for the price I had budgeted. 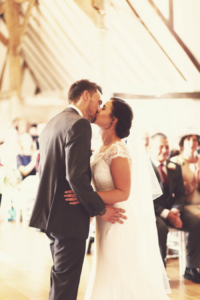 I choose Gez Harris Photography, I knew Gez and saw some of her work which was fabulous. Often photographers only provide electronic copies of all the photos but what I particularly liked about Gez was that you could pick a package where you got all the photos electronically as well as some A4 prints and canvases and she also put a photo album together for us. The photo album is just amazing and a lovely keepsake. 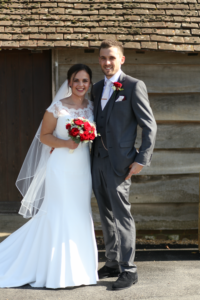 Gez was absolutely amazing, she photographed us from the bridal preparations all the way through to the first dance. 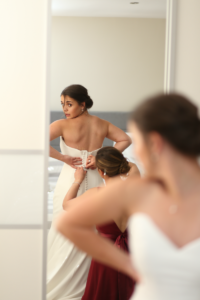 She made us feel so at ease and even helped out with bridal preparations in the morning! She got so many amazing photos which we will cherish forever but on top of that she was so subtle when taking the photos, I barely noticed her snapping away. Who did your hair and makeup and where did you find them? Becca Louise Hair and Make Up did the hair and make up for me, the bridesmaids and my mum. I know Becca through a friend and was told that she was amazing and that certainly is true. Becca came and did a trial with us prior to the wedding and I knew instantly she was the person I wanted to do my hair and make up. The make up was beautiful but also subtle at the same time. 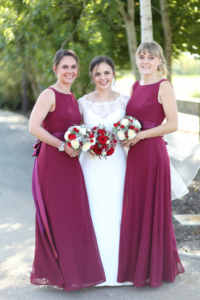 I had an up do for my hair which was a lovely low bun with a plait running all the way through, Becca had a tight timescale on the morning of the wedding but stayed so calm and did an incredible job on everyone, my maid of honour, bridesmaid, mum and me. I felt amazing and my hair and makeup stayed beautifully intact right up until 1am when the wedding was over! I would recommend Becca to anyone. The Blooming Workshop did our flowers and they were stunning. 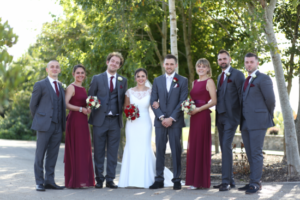 My bridesmaids and the groom and groomsmen were wearing a wine colour so the bouquets had red and ivory roses. I had a beautiful soft loose hand tied bouquet. I was sad to let go of it but have kept and pressed some of the flowers. They also provided flowers for the barn and on the tables at the wedding breakfast and put fresh flowers on the wedding cake. They were simply beautiful more beautiful than I could have ever imagined. How did you feel on the morning? Walking down the aisle and during the ceremony? On the morning of the wedding I was surprisingly calm, we had a lovely morning getting ready together and I just couldn’t wait to see George at the end of the aisle! As my dad and I got in the car and started to drive to the ceremony the nerves began to kick in, it all started to feel very real. 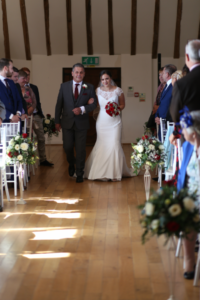 My wonderful Dad walked me down the aisle, we stood at the top of the barn arm in arm both feeling nervous and simply looked at each other smiled and nodded and off we went. Walking down the aisle was nerve racking but a lovely feeling, all eyes were on me but it was lovely to see all those familiar faces and seeing George at the end immediately made me feel more at ease. The ceremony seemed to fly by but at times as we focused on each other it seemed as though it were only us two in the room. My sister did a beautiful reading for us and the cheer and applause we received as we said I do and shared our first kiss as husband and wife was overwhelming. 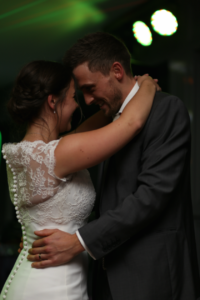 Our first dance was to Ed Sheerans ‘Perfect’ slightly overplayed now but at the time it was quite new! When listening to the lyrics George and I felt like it reflected our relationship. The funniest moment of the day was during the speeches we heard a loud bang from the back of the room. We thought someone had fallen off their chair but in fact someone’s chair had broken! It’s impossible to pick one moment from the day. The whole day was perfect and ran so smoothly. We could not have asked for a better day. The sun came out for us and we were so lucky to have the best family and friends there to celebrate with us. 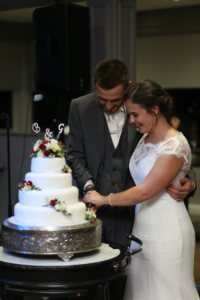 The ceremony was beautiful and so special, the wedding breakfast was delicious, the speeches were fabulous and the evening went off with a bang when the wonderful band ‘Take Note’ started playing. Having live music was amazing and so much fun. My very talented Dad made an amazing 4 tiered cake which looked and tasted amazing. The florists also decorated it with fresh flowers. Take Note. This band is amazing, and I would recommend them to anyone., I had so many comments on what a great band they were. They made the evening and created the best atmosphere, we were on the dance floor from beginning to end! Thank you so much Beth for sharing.